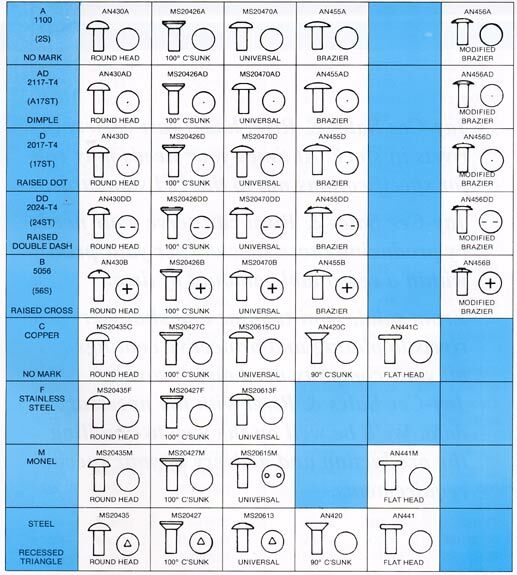 Rivet Identification Chart | Rivet Head Styles and Markings | Jay-Cee Sales & Rivet, Inc.
We carry a commercial equivalent line of Military Standard rivets and Army Navy Specifications rivets for all standard rivet head styles and markings. For more information, use the chart below, or call us today. Head style is an important consideration when choosing a rivet. Some rivet heads project out from the surface of a part after installation, where others lay flat or flush with a surface. Head type is especially important for applications where drag and wind resistance are determining factors, or when the rivets are being installed on moving parts. Round Head Rivets: are the most commonly used type of rivet and feature a dome shaped head and a flat bearing surface. This head style sits higher on the surface than other rivet styles. 100° Countersunk Rivets: countersunk rivet with 100° head. This aerodynamic rivet style sits flush with a material or part surface once installed and are frequently used for applications involving moving or rotating parts. The length measurement for this rivet style includes the head and tail or shaft. 90° Countersunk Rivets: features an aerodynamic 90° head that sits flush with a part or material surface for aesthetics or to prevent the rivet from catching on moving or rotating parts. The head of the rivet in included in the length measurement. Universal Head Rivets: also known as button head rivets, this style has a rounded head with a lower profile than standard round head rivets. They are “universal” because they can be used in place of any rivet head style (round, flat, brazier, etc.). Flat Head Rivets: have a head that lays flat on the part or material surface. Brazier Head Rivets: button head rivets that feature a wide, shallow head that provides a larger bearing surface under the head for greater resistance to pull through. Modified Brazier Head Rivets: button head rivets that feature a lower profile head design than full brazier head rivets. Since solid rivets are produced in a range of materials that, special markings are placed on the head of a rivet to help identify the type of alloy used. This is important because rivet materials are chosen based on unique properties such as corrosion resistance of yield strength that are required by the intended application. Various codes are used to specify rivet material type, head type, diameter, length and industry specifications. See the information below for an overview of the codes used for our products and in our Rivet Identification Chart. AN - When these two letters precede numbers, they indicate Army and Navy Specifications. MS - When these two letters precede numbers, they indicate Military Standard Specifications. 470=universal head, 430= round head, etc. =1100(2S) Aluminum, AD=2117-Aluminum Alloy, F=Corrosion Resistant Steel, etc. The diameter of a rivet is indicated in 32nds of an inch. 4=4/32" or 1/8", 12=12/32" or 3/8", etc. The length of a rivet is indicated in 16ths of an inch: 8=8/16" or 1/2", 10=10/16" or 5/8", etc.